New Delhi: The Supreme Court today dismissed a plea seeking the laying down of guidelines on how the procedure for cesarean deliveries has to be conducted in hospitals, saying the petition was an abuse of process of law. A bench headed by Justice Ranjan Gogoi also slapped a cost of Rs 25,000 on the petitioner and directed him to deposit the amount within four weeks with the Supreme Court Bar Association. “What is that you want? How much cost will you pay, you tell us? 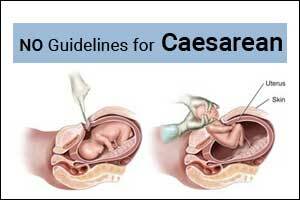 You want the court to lay down guidelines as to how cesarean deliveries has to be done? Is it a PIL (Public Interest Litigation),” the bench, comprising justices R Banumathi and Navin Sinha, said. “Having perused the PIL, we are of the view that the same is an abuse of process of law,” the bench added. The petition was filed by Reepak Kansal, who had alleged “flagrant violations and abuse of health norms” due to a lack of policy, and claimed that several private hospitals and maternity homes often conduct unnecessary C-section deliveries to make money. Kansal also said that the World Health Organisation recommends caesarean section to be performed only when it becomes a medical necessity. He claimed there are numerous instances in India where C-sections are performed without medical reasons by private hospitals with an intention to make money. His petition also claimed that a C-section delivery involves an extended stay in the hospital as compared to normal childbirth. Further, he said that private hospitals have a much higher rate of C-section deliveries than government hospitals and this was a “clear indication that these institutions deliberately perform C-sections as it was directly proportionate to the fact that surgical deliveries cost much more than normal deliveries”. Kansal, in his plea, sought the constitution of a medical board for monitoring the activities of private health institutions with regard to C-section deliveries. Good judgement. Govt. should not infringe on our rights to our body. The decision should be left to the patient and the doctor. Who decides what is unnecessary anyway? Are they banning cosmetic surgery now? Do we need guidelines for ligament surgeries, stent surgeries? Let\’s not open that pandora\’s box. No head and no tail of judgement and even petition is made out. Simple. When consumer protection act is there patient is at liberty to file a case and thus find out any procedural lapse.medicine is an art and technique no body shud fiddle with it unnecessarily otherwise we will have quackery .if govt hospitals have normal delivery more vis a vis pvt hodpitals then patients have the liberty to go to sarkari one. But one shud know the maternity mortality and morbidity ra rate in govt hospital in comparison to pvt ones. I agree with Dr deepak Sharma. For a doctor,Priority is patients life. If govt charges are less why they come to private set up. They should complain against Govt hospital charging . Why are they charging at all. All expences are met by govt. ? In private set up one has to spend for everythinf from A t Z eg Light,water, linen, Cleanliness concerned( Broom, phenyl, Soap , Laundry, & all Staff , Govt taxes, Income tax, Stationary for hospital purpose( admissuion slips, Case sheets, Files etc, ) Xrays, Lab & whatever is needed for patient. So if not spent , how can one runthe Hospital? Can do only consultation practice with minimum resourses & cant do justice to the patient esp these days of advanced technology. So Govt should rather encourage private set up to improve with atleast encouraging them instead of harassment with the push of vested interest people, spoiling the name of Noble Medical Profession. They should only harass few black sheeps who are corrupt.Otherwise Improve the standard of Govt Hospitals by giving more share of money to health care & stop private practice totally.Then there will be only Govt Hospitals left for medicare. Instead of spending for ub=nnecessary things, they should focus on present situation of self sufficiency in health care.